Laurence Beeke considers what it means for his SinkFix product to be associated with the iconic Rawlplug brand. ‘As rare as hens’ teeth’, ‘rare as is true love’ (although maybe I’m a little cynical with that one). However, the facts remain that certain things are difficult or sometimes even downright impossible to achieve. Within today’s global business market, achieving a recognisable brand is something that all aspire to but few rarely achieve. For me – now over 50 – a few stand out. Founded in Ohio 111 years ago by William Henry “Boss” Hoover, the HOOVER vacuum cleaner dominated the market to the point where the brand became synonymous with vacuuming itself, even becoming a verb in the English Dictionary! How ‘hoovering’ a room with a Dyson must send shivers through certain individuals! While all this was going on over in the States, back here in good old Blighty at roughly the same time (1910) was a man named John Joseph Rawlings. He had been commissioned to renovate the British Museum without disturbing the fabric of the building too much. Finding a solution to the fixing problems associated with doing this, he invented the first ever wall plug – or as we all now know, the Rawlplug. How often did you hear your grandfather mentioning it or asking you to hand him one? I certainly did, as was the case with my father too and even now I go into a merchant and ask for Rawlplugs. It truly has become a recognisable brand around the world. With this in mind, it is a privilege and honour for me to be associated in some small way with this historic brand. As of March 2019, we are delighted to announce that Rawlplug Ltd has sole rights to sell and distribute our SinkFix plate, the only adjustable fixing plate on the market for wall hung wash basins suitable for standard or plasterboard walls. Like Mr Rawlings 109 years ago, I invented this out of necessity as no other fixing method worked for me. True, it’s not ‘rocket science’ but nor was the humble wall plug all those years ago – yet it changed the world of construction and created one of the best and well known fixing companies in the world. It’s personally been an interesting journey for me coming from a different industry, and I have met some inspirational people. 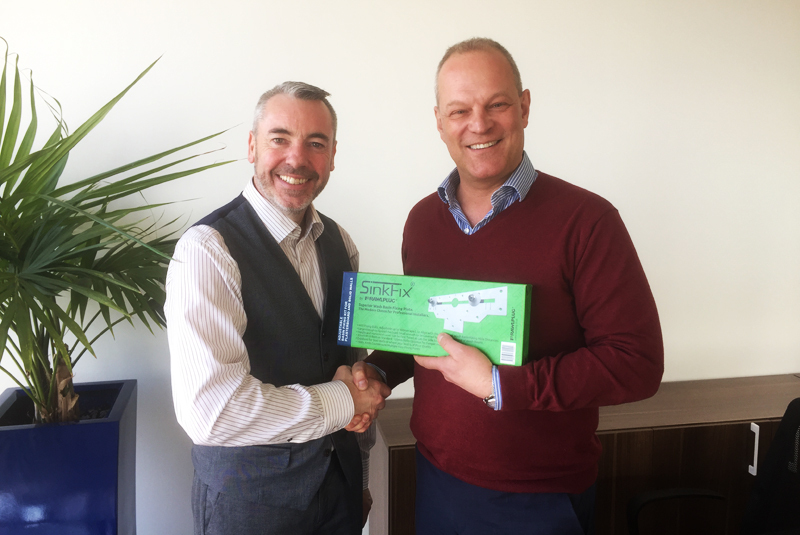 To be offered an investment on Dragons’ Den in 2018 by Deborah Meaden reinforced the product’s market value and viability, and now to be shaking hands with Dr. Pietro Grandesso (MD) and Jonathan Metcalfe (DIY/trade sales director) – who are leading Rawlplug to new innovative and creative heights here in the UK – is like finding that idiomatic ‘chicken with the tooth’. I’m very much looking forward to working closely with Rawlplug in the future and developing new products within the fixings industry. Watch this space. Next : What is stopping women from working in the trades?